I'm trying to automatically download PDFs from a website (job posting) thanks to a IE automation in VBA and for some reason I don't manage to generate a single PDF. Doing it manualy by going on the web page and doing a 'save target as' on the pdf icon works fine and gives me a valid PDF but the automation fails. I don't understand why and hope someone will be able to give me a hint. The initial job page automated clicking on the target href doesn't generate a viable page link. This is presumably because the important stuff actually happens server side. This launches a new window which is why Selenium is great. Selenium has methods to switch to this new Window. 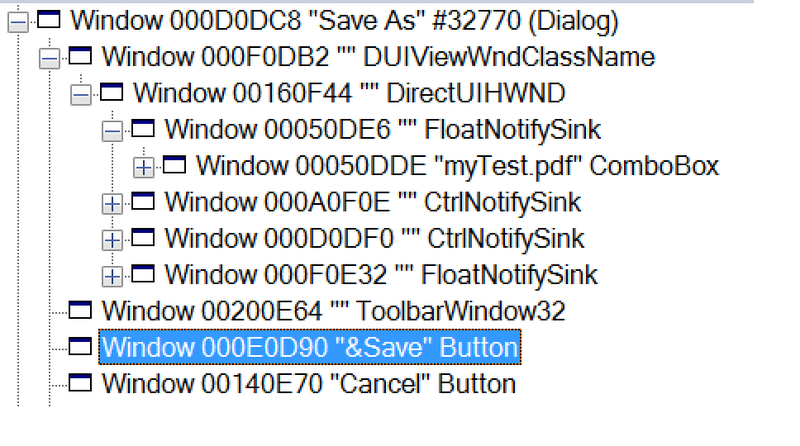 Otherwise, you can use the FindWindow methods I detail later in the answer for finding the Save As window. In this new window you cannot interact with the buttons in the way you can normally when scraping as the required content is not available via the DOM. If you examine closely you will see the pdf button is in shadow-root i.e. where you cannot access. This is a design choice. I do need to investigate this possibility (selecting through the shadow DOM using '/deep/' combinator) at some point but I don't think it holds true in VBA. I am using selenium basic VBA wrapper and APIs to mimic the actions on screen to save as pdf using the Save As Window (see image at very bottom) . Particularly making use of Save keyboard shortcut via SendKeys. This works. I used Spy++ to check the Window tree structure and check Window Class names and Titles. 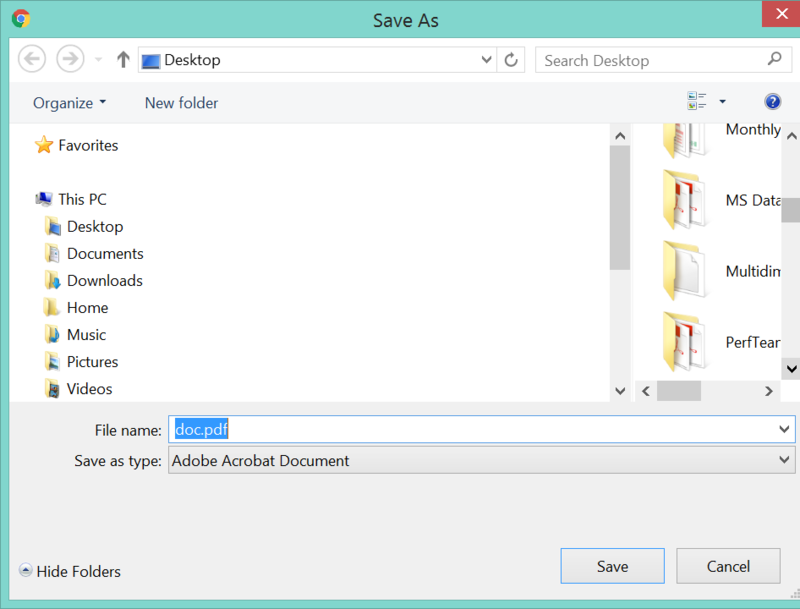 I use SendKeys to automate the opening of the Save As dialog for the pdf. I then descend the Window tree structure to get handles on the ComboBox where the file name is entered, so I can send a message i.e. file name to it, and on the Save button so I can click it. You may need a longer wait to ensure download goes through correctly. This bit is a little buggy in my opinion and I hope to improve. It is fairly robust. I used Selenium Basic for the ease of working with iframes and getting round same origin policy problems. With IE you cannot simply grab the src link of the iframe and happily navigate onto the page for the pdf print from the original add. What you can do, I believe, is issue an initial XMLHTTP request and grab the src attribute value i.e. link. Then pass that src link to IE and then carry on as shown below for the Windows handling parts. This is written for 64 bit. 32 Bit remove PtrSafe. You could switch LongPtr for Longbut I think it remains compatible. Huge thanks to @ErikvonAsmuth for his enormous patience in going through the APIs with me. Take a look at his excellent answer here for working with Windows. Using shadow DOM - Developer Mozilla pages. Not the answer you're looking for? Browse other questions tagged html vba internet-explorer web-scraping pdf-generation or ask your own question. How to access elements under `shadow-root` at 'chrome://downloads' using jquery and selenium?